Last night, as a result of my older son's beseeching, we re-watched the movie Taken, with Liam Neeson. "I don't know who you are. I don't know what you want. If you are looking for ransom, I can tell you I don't have money. But what I do have are a very particular set of skills, skills I have acquired over a very long career -- skills that make me a nightmare for people like you. If you let my daughter go now, that'll be the end of it. I will not look for you; I will not pursue you. But if you don't, I will look for you; I will find you, and I will kill you." It occurred to me, last night, how good it is to watch a film whose morality is so black and white and whose protagonist is so perfect at what he does. When he delivered those lines last night, I found myself welling up. If you do it the right way, it is hard to be a "real man." Being a real man is defined many different ways and, as you might expect, my definition contains a lot more than being able to go around -- as an Amish woman in Witness describes it to Harrison Ford's character --"whacking people," but that definition of mine does contain toughness. But, to be able to have full and unfaltering confidence in your ability to "whack people" who try to hurt your child...? That's just sublime. Sure -- to be that guy is a fantasy. It's a movie after all...but, what a fantasy. It's a Rocky thing: an ideal of traditional manhood stripped to the primal. All dads want to protect their families from harm. The difference between all dads and Neeson's character is that all dads have doubts and weaknesses. It's nice to wade in the pool of total confidence, if only for two hours. It's also nice to watch a film in which the character is not conflicted or morally questionable. Again, it is an escape from reality; real people are morally conflicted and questionable at times and my fiction writing teachers spent years reminding me not to write characters who are all good. I suppose, also, it can be argued that anyone who kills as many people as Neeson does in that film can't be all good, but, when he steals cars or kills people, it is in order to stop his daughter from being sold into forced prostitution. That's a pretty good argument for "crossing the line," if you ask me. When I watch Indiana Jones shoot a guy who is showing off by flipping around a sword he intends to kill him with, I think, Hmm. That was questionable, if very darkly comical. When I see Liam Neeson electrocute a guy who abducted, drugged and sold his teenaged daughter, I smile the smile of the guiltless and I sleep just fine. Taken is a heck of a dad-catharsis. We need stuff like that from time to time. Not everything can be Pride and Prejudice, nor should it. 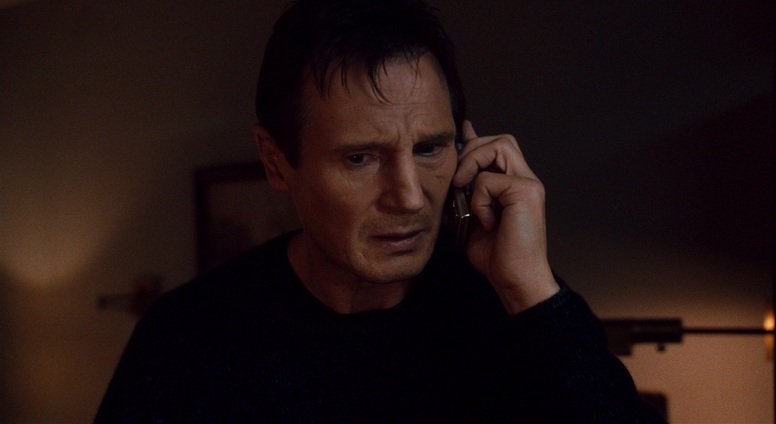 My older son takes great delight in quoting the "I will find you" speech word for word. I think there's a particular enjoyment in watching an action movie with one's son - I suppose it's a sublimated version of beginning to hunt together - but I also think it justifies a guilty pleasure. I can pretend that I'm watching 'Die Hard 4' for my son's benefit, rather than admit the sordid truth. No guilt necessary, I say! We are what we are... I love Keats and all, but I'm always up for a good Rocky movie. It's like with music. Sometimes I want "Afternoon of a Faun." Other times, I want "Whole Lotta Love." I'm cool with that.